Truffles - Available for Adoption! 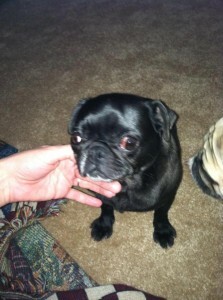 Truffles is a 2 year old female rescued from a puppy mill. She is up to date on her vaccinations, but has not been spayed at this time. We are being a cautious as she had a reaction to the morphine so we are waiting for further testing before proceeding with a spay. We will update more on Truffles once she’s had some time to adjust to her foster home and also let you know about her spay.